A suspenseful watch backed by a great story, M asks heavy moral questions about the open door policy of the legal system, and the rights of victims who deserve justice when the law is forced to defend the rights of a murderer who is driven not by freewill, but by an overwhelming insanity. Despite it being 77 years old, M is a film which still packs quite a punch. Set in Berlin, it focuses on a series of grizzly child murders which has flipped the city upon its head, as mass hysteria takes over and everyone is deemed a suspect. Fed up with the police's inability to catch the killer (played by Peter Lorre), a large group of criminals attempt to find the child murderer themselves, as the hunter becomes the hunted and the law is discarded as an annoyance. 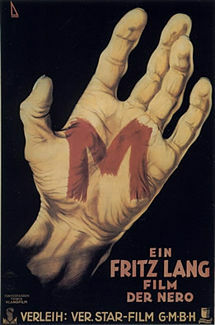 M is a highly influential German film directed by acclaimed filmmaker Fritz Lang. It was his first "talkie" after years of lauded silent features, including the ground breaking and avant-garde Metropolis. Here is a key example where daring and innovation far surpasses its faults, and to be fair, said faults - in particular its grainy black and white photography - are simply a product of its vintage standing, and actually adds to the films dark atmosphere. Lang takes full advantage of the tools at his disposal while pressing the fact that film is foremost a visual medium; overhead shots are a favourite, and his use of shadow is breath taking, especially when he introduces his killer in the form of a sinister silhouette. The films editing - courtesy of Paul Falkenberg - is equally impressive. Two key sequences benefit from Falkenberg's touch: the first is a montage which highlights the difficulties of the police investigation; and the second sees Falkenberg cutting back and forth between two group meetings from opposite sides of the law, as both cop and criminal flesh out their strategies on how to find the killer. Lang incorporated the ground breaking use of narration in both sequences which gave it an extra flavour; while in other scenes chilling periods of silence contribute to the films off putting vibe. Also playing a big part is a superbly cast, pre-Hollywood Peter Lorre, whose cubby face, bug eyes and slightly crooked teeth perfectly matches his character. His confession near the films end on how finds the sight of a child intoxicating is both disgusting yet annoyingly sympathetic. In previous scenes the viewer witnesses how he lures his unsuspected victims with sweets and toys to their fatal end, all the while whistling Evard Grieg's "In the Hall of the Mountain King". It is a magnificent performance.